Without a doubt, the branded mobile app has become a mainstay of mobile marketing across segments. But recently, stagnant app usage along with the rise of other mobile channels has challenged brands and led many to realize that their mobile marketing strategy can be overreliant on apps. It isn’t that brands shouldn’t invest in their app, but that consumer usage data shows us it’s not enough on its own. This is now leading them to research new channels, and based on customer work I’ve been involved with lately, one in particular has been standing out. Mobile wallets that are native to a device have been available on most phones for years, but the branded passes they manage still remain an underused tool that offers a well-suited complement to apps because of some of the unique features they support . Syniverse’s strategic partner, mobile marketer Vibes, just helped shed light on this with a recap of several Forrester Research reports that spotlight the emerging opportunity for mobile passes and related mobile marketing opportunities. I invite you to read the Vibes recap, which includes a recently published Syniverse mobile wallet infographic, and find out more about what the latest data points to for mobile marketing. Considered a “cash killer,” the mobile payment industry is skyrocketing in growth around the world. According to Forrester Research, mobile payment transactions will grow in the US alone 20% a year through 2021. At that point, the value of mobile transactions will have increased from $112.2 billion at the end of 2016 to $282.9 billion annually (US Mobile Payments Will More Than Triple By 2021, Forrester, January 2017). Clearly this is not a flash in the pan. In the last few months, market research firm Forrester Research has developed several reports around mobile payments and mobile marketing. If you are moving into the mobile wallet marketing space, it’s smart for you to know what the experts are saying. China Leads; Could the US Be Far Behind? In Forrester’s April 2017 report, Engage Customers With Mobile Wallet Marketing: What Global Players Can Learn From Asia’s Digital Leaders, we learn how ubiquitous mobile wallets already are in China: 76% of metro Chinese consumers use mobile wallets or are interested in them, whereas 36% of the urban online US population is actively using mobile wallet features or are interested in them. Payment apps in China are just behind weather apps in terms of popularity, and 51% of Chinese metro mobile phone users utilize a payment app. While adoption of mobile wallets was slow until recent months in the US, Forrester uses the term “hyperadoption” to describe China’s rapid integration of the mobile payment tool. The mobile payment service WeChat acquired 100 million new users in less than 14 days. Chalk the US’ lagging behind to much dispute among financial institutions a few years ago. Now that the argument has dissolved, the US is starting to catch up. Chinese mobile wallets already incorporate both private and public sector functionality; users can upload an image of their driver’s license and forego the plastic version, and they can interact with their public service accounts through mobile wallet apps, paying bills and updating their services. Currently, the features of the US mobile wallet apps (Apple Pay and Android Pay being the predominant players right now) haven’t exceeded far beyond storing payment data and offering promotional content, though expect that to change in the very near future. If the smashing success of mobile wallets in China is any indicator of what’s to come for us here in the United States, we’re in for some great innovation. Similar to Alipay and WeChat in China, Syniverse surmised that the US market will provide additional functionality and features that will amp up customer engagement before, during, and after a purchase. 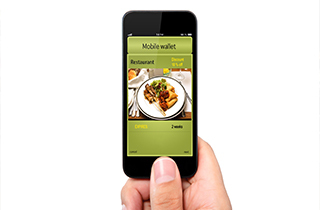 The future of mobile wallets may also better engage customers in brick-and-mortar stores. For example, PayPal offers features like “stores nearby” and “order ahead” to drive sales offline in addition to online. Expect to see, as well, interesting integrations with other platforms. Gmail for Android allows users to send others money directly through Android Pay. And while Apple and Android currently dominate the marketplace, we may first see other third-party providers expand the mobile wallet space (take Kohl’s Wallet feature of its mobile app, for example). While this would serve to familiarize a wider audience with the mobile wallet concept, these third parties would likely end up being integrated back into the core wallet providers, the way they are in China. In the WeChat app, users can utilize other brand’s mobile payment features, such as ordering and paying at Starbucks or ordering a taxi. China is a shining beacon to the rest of the world in terms of demonstrating the pure power that mobile wallet marketing offers to brands. Here’s to rapid growth and success here in the US. Cullen Talley is a former Vice President of Financial Services at Syniverse.